Take some time and vote in my poll to the right hand side. Who does everyone think will win the World Series? I know it seems a little early now, especially when the final playoff spots are still up for grabs, but it is always fun to claim your team early! Obviously, I will always think the Yankees will make it every year and win the championship, but even an owner who "buys a team", as Eric so nicely puts it, does not win every year. Speaking of buying championships, did the Boston Red Sox not buy their championship team last year? In response to Eric's post, David Ortiz is a definite contender for the MVP. He is a power hitter, and can come through in the clutch. I would haved loved to have seen a game.I did get invited to Baltimore with our friend Jake Fox, but school work got in the way :( Jackie, I would love to go to NY if the team wins! When did you go to the parade? As I do not have the luxury of the YES Network ( a Yankees owned television network available in certain New Jersey and New York areas) to watch the Yankees game tonight, I am watching on the Yankees Website , and as of the bottom of the 4th , they are losing 1-0. Sean Chacon is pitching against Daniel Cabrera. This is not good, as there are only 5 games left and three teams, the Yankees, Rex Sox, and Indians, are all vying for a playoff spot. The Yankees and Boston are tied as of today for the first place in the AL East, and the winner will go to the playoffs, and for the AL Wildcard, all three teams have the exact same record. Whoever begins to lose games will most likely be out of the playoffs. Every game is a must win situation at this point. Tonight's game is especially important for the Yankees as they were delieverd a huge loss yesterday, and the Red Sox won. Hopefully the second half of the game the Yankees can come back and win the game. A-rod should show why he should be the MVP winner! Nicole, I think your interactive poll is awesome. Your going to have to show me how you did that. I think I am going to vote for the Yankees. Although my heart lies with the Mets, I enjoy rooting for the Yanks and seeing them go far in the post season. I was actually at the game against Baltimore on Wednesday. The Yankees won and the game was a thriller. Camden Yards, the Orioles stadium is really nice and it was a great night for baseball. Although we had cheap upper deck seats, we were able to sneak into the seats in centerfield. The seats were great as we were practically sitting on the field! Who do you think will win the American League? A-Rod or Big Papi? Also do you think this final series between the Yanks and Sox should decide who wins it? I do not think that voters should vote for the MVP based on who performs the best during the series. The season is a lot longer than 3 games. Do you think that since A-Rod plays defense and Ortiz is only a DH that A-Rod is more vlauable to his team? Keep up the good work. I look forward to following the yanks during the postseason. Nickie- I was at the game that you were invited to- and you should have gone because we had absolutely amazing seats. (Not to rub it in or anything.) And Mariano Riveira threw me a foul ball but some stupid boy jumped in front of me and took it!! I was so mad! You missed a very exciting game because the Yankees ended up winning that game with a score of 2-1. If you ever have the chance you should definitely go to Camden Yards- it is an absolutely beautiful stadium- very clean, and there are different things to do once you get into the stadium. I especially love how you can watch the batting practice and there is a special spot where you can stand where most of the home runs go so that fans can get them. So if you are ever in the Baltimore Area you should definitely go check it out. Merry Playoffs!! I am so glad that the Yankees won the AL east for the eighth straight year in a row. It was so nice watching all of them celebrating on Saturday after their 8-4 victory over the Red Sox. Randy Johnson pitched a solid game, it was nice to see that the Yankee offense was on! I am glad they aimed for the AL east title instead of the wild card, it just would not fit the description of the Yankees if it were any other way. All I have to say is that A-Rod better take the league MVP, because David Ortiz doesn't even play the field. 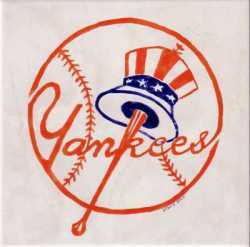 I look forward to cheering the Bronx Bombers on, on Tuesday! Let’s go Yankees! !